The Penryn Guest House is located at 126 Alcester Road in Stratford Upon Avon. Check room availability using the search box on your right. Stratford upon Avon has so much to offer our visitors. As well as the beautifully maintained Shakespearean properties there are theatres, museums, leisure facilities and a wealth of shops and restaurants to suite all tastes and budgets. A hearty breakfast is served in the dining room and for guests who prefer a less formal start to their day a cold breakfast selection can be delivered to their room. Our aim is to make your stay as comfortable as possible. All our rooms are ensuite and tastefully decorated. A colour television, hairdryer, clock radio and refreshment tray are all provided together with access to email and fax facilities. 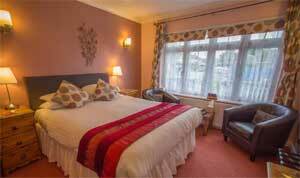 As well as double and twin rooms we have family style accommodation sleeping up to 3 or 4 people.